Nigerian College Of Aviation Technology, Zaria [FS, AME, ATE, ATS/Com, AM] Training Programme/Course Screening Schedule for 2018/2019 Session. 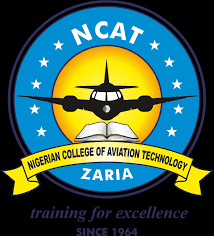 This is to inform all candidates who applied into the various training programmes/courses of the Nigerian College of Aviation Technology, NCAT Zaria for 2018/2019 academic session that the screening schedule is been announced. Prospective applicants are to always check their registered phone number and email adress to be updated of their various screening date, time and venue. This page will also be updated with the latest screening scheduled as they are been fixed for the various training programmmes. Text Messages have been sent to all prospective Standard Pilot Course No. 33 Applicants, that SP-33 Selection exams Scheduled to take place on Monday 15th to 19th Oct, 2018 by 9:00am in the College, Zaria. 2. Text Messages have been sent to all qualified prospective HND AVO & A&P course NO. 5 Students, classes schedule to commence on 15/10/2018. The Admission letter is ready for collection at the Academic office, NCAT, Zaria. Text Messages have been sent to all shortlisted prospective Cabin Crew Course Applicants, that Cabin Crew Selection Exams Scheduled to take place on 11th December, 2018 at NCAT, Zaria, by 9:00am. Please come with your original credentials, Exams will be on Maths, English & current Affairs. 4. Text Messages have been sent to all shortlisted prospective Standard Flight Operations (SFO-22) Applicants, that SFO-22 course Selection exams scheduled to take place on Tue, 18/12/2018 by 9:00am in the College Zaria. Come with original credentials, exams will be on Maths, Physics and English. You will be responsible for your transport, accommodation & feeding during the period of the exams. For further info, call: 080 359 058 64, 080 382 550 03.